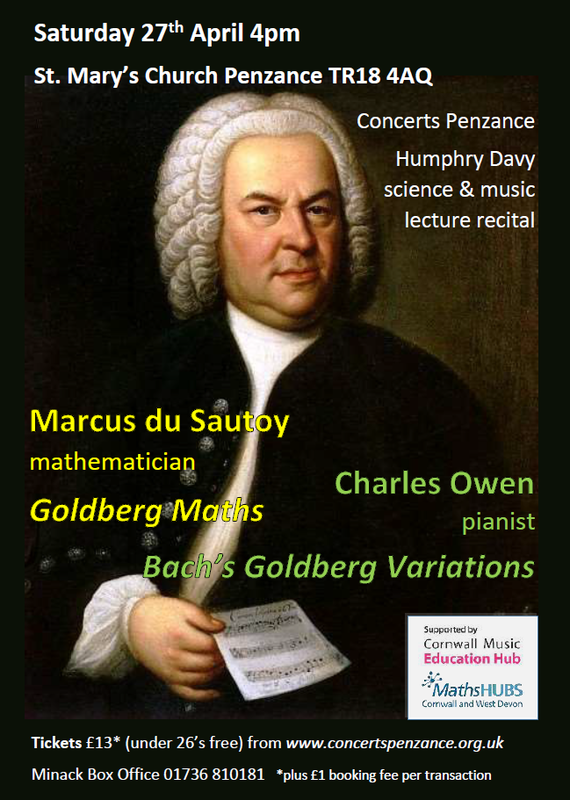 We are very pleased to announce the return visit to Concerts Penzance by mathematician Marcus du Sautoy and the first visit by pianist Charles Owen on April 27th. Marcus explores the maths behind Bach's Goldberg Variations with musical examples, followed by a comlete performance of Bach's masterpiece. 'In his right hand, Bach is offering us a complete compositional kit, a musical riddle that’s called “Canon triplex à 6 voc”, a six-voice perpetual canon, which loops back on itself, again and again. The riddle takes some solving, as Gardiner does in his book. To generate the six voices, you have to read the three parts in the clefs that Bach is presenting, but then you need to read backwards from his perspective in different clefs, and there is even a “double mirror canon” there too, “if we reflect the notes along the middle line of each stave”, as Gardiner says.